This gorgeous penthouse home is both impressive and comfortable. 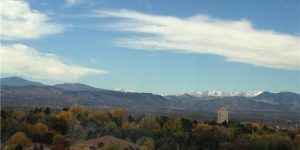 With its commanding panoramic views, you will wake up to vistas of the Rocky Mountains unmatched by any other property in Denver. This 5-bedroom, 5-bath home can function well for large parties or cozy evenings by the fireplace. The building grounds offer wonderful amenities. You will find whatever you need, from lush gardens with a walking path, a koi pond and fountains in the atrium, an exercise room, indoor swimming pool, party and recreation rooms, a heated garage, guest parking, and 24-hour front-desk attendant.